Generally speaking, arson is the unlawful starting of a fire. More specifically, charges for arson arise from setting a fire or causing an explosion either intentionally or recklessly. Most people think of arson as setting a building or car on fire to collect insurance proceeds. Make no mistake - this qualifies as arson. Arson is, however, not limited to these more common scenarios. Setting fire to vacant land either intentionally or recklessly, starting a fire or causing an explosion that places others in danger, starting a forest fire, or failing to control a lawfully started fire, are all actions that can result in arson charges. In fact, arson charges can be based on a wide array of conduct that relates to starting fires or causing explosions. Arson can be a crime of the first, second, third or fourth degree. The degree of the charge depends upon the defendant's intent, the target of the fire or explosion, whether persons or other property were exposed to danger, and whether the defendant was to be paid for his or her actions. First Degree Arson - This is commonly referred to as "arson for hire". Anyone who accepts payment, or offers to pay money or compensation in exchange for setting a fire or causing an explosion can be charged with first degree arson. The money or compensation does not have to be actually exchanged to sustain the charge. Setting fire to a church, synagogue, or other house of worship will also result in a first degree arson charge. Second Degree Arson - This is also known as "aggravated arson". A second degree arson charge can stem from conduct that in addition to starting the fire or causing the explosion: (a) knowingly puts another person in danger; (b) Shows an intention to destroy a structure that belongs to someone else; (c) Shows an intention to collect on insurance covering the destroyed property; (d) Qualifies as an attempt to exempt a structure from land use regulations; or (e) exposes a forest to destruction or great harm. Third Degree Arson - This arson offense can be charged when the defendant started a fire intentionally with the goal of destroying a building or vehicle, and recklessly exposed another person to danger. Fourth Degree Arson - This offense is charged when the defendant had some obligation or duty to prevent or fight a fire, failed to take reasonable steps to do so, and someone's life or property was endangered as a result of his or her actions or omissions. Individuals who fail to report a fire may, under certain circumstances, be charged with this offense, as can persons who fail to control a fire that he or she started lawfully. 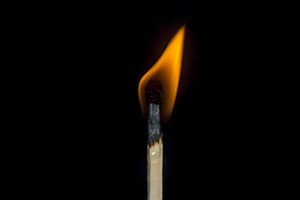 Depending upon the degree of the offense, a conviction for arson can carry a State prison sentence of 18 months to 20 years, as well as stiff fines. Further, the defendant can be required to pay restitution for losses resulting from the arson. Additionally, arson convictions cannot be expunged. Arson investigations can be highly technical. They frequently involve the use of experts by both the prosecutor and the defense to determine such issues as the manner in which the fire was started, and/or whether or not an accelerant was used. Defense counsel will frequently want to have the State's analysis reviewed by a defense expert, with an eye toward attacking its technical merits and conclusions. In New Jersey, arson investigations frequently raise the specter of insurance fraud, and often involve the Office of the Insurance Fraud Prosecutor. Thus, in New Jersey, charges for arson are frequently accompanied by charges for insurance fraud. Arson is a very serious crime, particularly in New Jersey. If you have been charged, or are being investigated, do not make any statements to any representative of law enforcement. Instead, contact the arson defense firm of James S. Friedman LLC - the firm with the experience and resources to defend arson charges successfully.